JON CRITCHLOW was the hero again for Bromsgrove as his 17-point haul helped his side see off Scunthorpe at Finstall Park. The full back landed a last-gasp penalty to secure Bromsgrove a dramatic win against Peterborough Lions last week and his boot was just as reliable on Saturday. Phil Horton scored the hosts only try of the game in the opening period, but it was Critchlow who stole the show as he dispatched a conversion and five penalties. Two of those came in the second half as Bromsgrove fought back from 17-16 behind at the break to clinch a third straight success in the league. Critchlow was unable to slot home his first attempt inside the opening three minutes, but he soon got the chance to make amends. With just seven minutes on the clock, Sam Bastock cut through the defence before offloading to Horton to score in the corner, which Critchlow superbly converted from out-wide. Scunthorpe responded well as they put a number of phases together before they were handed the chance to go for the posts from distance – and Johnson made no mistake. Bromsgrove were quick to cancel it out with a penalty from Critchlow to make it 13-3, but the visitors hit back with the first try of the game. After failing to find tough, Woody Vaimoso, who troubled the hosts most of the afternoon, weaved his way back into Bromsgrove territory before the ball found its way out to Colin Chapman who touched down. This stung the home side into action, but Scunthorpe defended well before landing another blow with a breakaway try, which was converted, just before the break. Bromsgrove had the final say in the half, though, as Critchlow took a well-taken penalty. Scunthorpe were leading by just one point and they had a chance to increase, but Johnson missed the target from the tee. Critchlow also went wide and the match appeared to be boiling down to the two kickers as handling proving increasingly difficult. 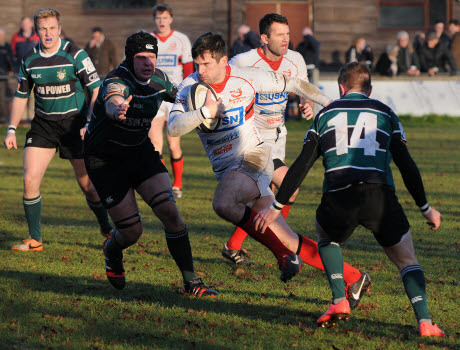 And it was Bromsgrove’s marksman who stepped up as he put his side 19-17 ahead after Scunthorpe went down to 14 men. Johnson, meanwhile, could not respond as he squandered a penalty chance right in front of the posts. This came after Bobby Green saw yellow, but Bromsgrove remained the better side and they finished victory when Critchlow coolly dispatched.